At the Brisbane Product Talks Meetup we have been, and will continue for a while, hosting guest presenters that have expertise in their domain and a thing or two to share on the topics of Product Management and innovation. We will be mining insights and examples of how to innovate effectively and see how organisations embrace a culture of innovation. Stuart has been a part of the evolution of ABC’s digital news through its 20 year history. In the past five years, he’s has nurtured a growing move within the organisation to adopt the disciplines of product management and apply them to news as a way to stay relevant and timely in a fast-changing digital media landscape. Here is a quick infographic review of the digital transformation of ABC News Digital. Is the Business section of the news a product? e.g. : Sport? Or, is the product actually the news content? Fundamentally, the content at ABS News is the product. The website, mobile app and social media derivatives are channels to distribute that content to engaged segments of Australia. However, from a practical standpoint the various channels for the content need to be managed like products. New channels are continually emerging, whilst others fall away in effectiveness as social/communication habits change. Each channel has a specific target audience, specific problems to solve and each has its own product lifecycle. 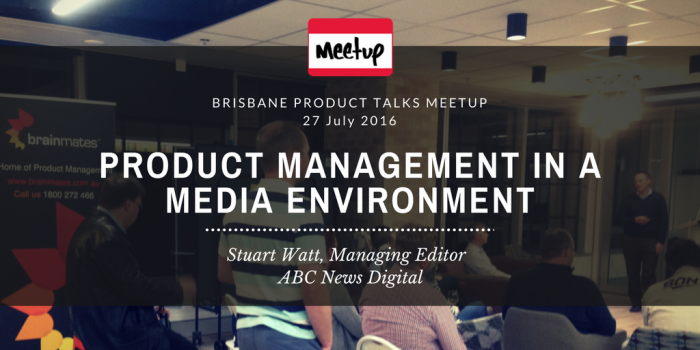 How Did Product Management Form at the ABC? Product Management is not a principle, or way of doing things that was planned at ABC News. It is something that just happened progressively over the past 10 years. User Experience methodologies were adopted a number of years ago and that was probably the catalyst agent that brought about the beginnings of a product management culture to ABC News. These days ABC News has implemented a rich array of product management related resources like user personas and user journeys into their business. This helps understand and empathise with various target audiences. Even though ABC News effectively needs to deliver value to every Australian it doesn’t mean the target audience for a product, or channel of distribution is designed to serve everyone. As product managers we know that a target audience (or addressable market) of everyone is a sure-fire way to create a worthless product. Instead, the team at ABC News specifically targets audience segments that are in need of a better service. For example, the target audience for a mobile news feed app could be the urban resident on their morning commute to work, on public transport and in need of entertainment. This provides a sufficiently tight addressable audience definition that a solution can be formed around and can be measured and monitored. Just as a Product Management culture formed gradually at ABC News without a distinct plan to do so until recently, so too did Stuarts move into a career as a Product Manager. Stuart has been an editor for many years and it is his principle trade. But like many other product managers, he came to realise one day he was performing the function of a Product Manager. I say, join the club Stuart. Who else started their career in Product Management accidentally? The Product Management team at ABC News Digital continues to experiment with new communication channels, like Medium and LinkedIn, to evaluate how effectively they get the news into the hands of the Australian population – where and when they need it. The ABC is legislated to be ‘an independent national broadcasting service to provide a balance between broadcasting programs of wide appeal and specialised broadcasting programs’. As digital habits change in Australia, so too will ABC News Digital to ensure news is delivered in relevant ways.